If you've taken the leap and purchased a fine watch (such as those found in T3's guide to the best watches for men) the next step is to look after your investment appropriately. We'd suggest you start with some storage, such as one of these watch rolls or travel cases. These are the best way to protect timepieces from being scratched or broken, and even keep dirt and dust from ruining your shiny watch. But first, you need to decide exactly what you want from your watch storage. There are two types of watch roll, simple canvas or leather wraps, or structured hard cases. The soft rolls are usually made from leather or suede, and will provide organisation, and adequate protection against scratches. They're lightweight and compact as well, so are perfect for travelling, when space is at a premium. If you're after even more protection, a watch case is more for you. The consequence is that these are more bulky, but we've collected some more compact options here. So, whether you’re just starting a new watch collection, or are a seasoned watch collector looking for something new to throw in your carry-on – we’re sure you'll find the perfect option in this guide. We love this stylish watch roll from Bamford Watch Department. The company has made a name for itself in the industry by personalising and customising fine timepieces, so it's a natural transition to move into accessories. This roll is made from thick camo-print suede, and has enough space to fit six pieces. The Richmond Leather Watch Roll is hand crafted in soft, chrome free, eco friendly, leather. Heavy stitching accentuates the rugged leather and striking hexagonal profile. The Richmond leather watch case is fitted with two magnetic snaps for easy access, and is lined in soft alcantara to protect up to four wrist watches. Keep your watches safe and sound in this beautiful leather storage case from Ted Baker. This case opens to reveal a suede(effect) interior with two removable watch cushions, separated by a leather divider. Inside the case, the central cushion features the words 'In The Right Time At The Right Place'. It's a very nice case at a very good price, it's just a shame there's only space for two pieces. 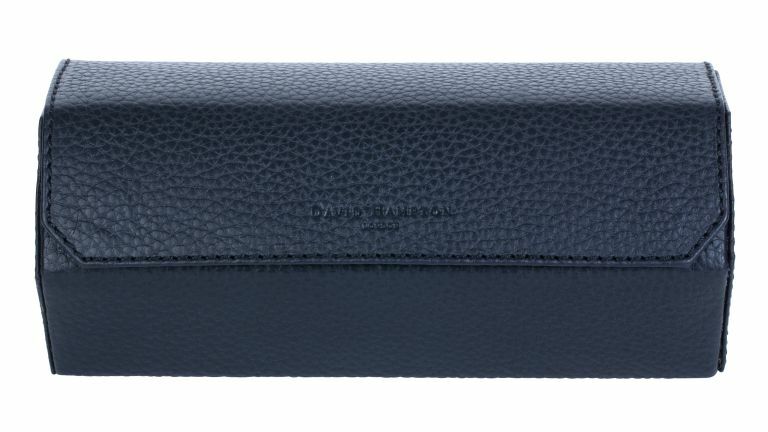 The Smythson 'Panama' is made in Italy from soft cross-grain calf leather, and will provide protection for your timepiece whether at home or on the move. The suede lining will prevent scratches and scuffs, while the snap fastening will make sure it stays closed. You can pair it with Smythson suitcases and carry-ons for a matching luggage set. The ideal solution for storing your watches at home. This Jacob Jones watch box securely holds up to four watches, so you can just slot it in your wardrobe. The snap closer makes it easy to open and close, but the large size and clunky latch means this isn't ideal for travelling. If you have a Patek Philippe (or similar timepiece) you should demand the ultimate watch protection – this watch roll from Bamford Watch Department. It's made from sleek and strong carbon fibre, contains a removable leather cushion and is lined in spongy neoprene to guard against scuffing. The Japanese-engineered ceramic glide rails ensure it's easy to twist open and access the four watches inside. The watch roll from Hense is hand-cut and handcrafted from high quality full grain suede leather. It's durable, compact, and lightweight, making it ideal for travel. It can store up to 4 watches, and is closed with a leather cord that keeps your treasured timepieces secure. Why not store your watch at home in one of the best watch winders?